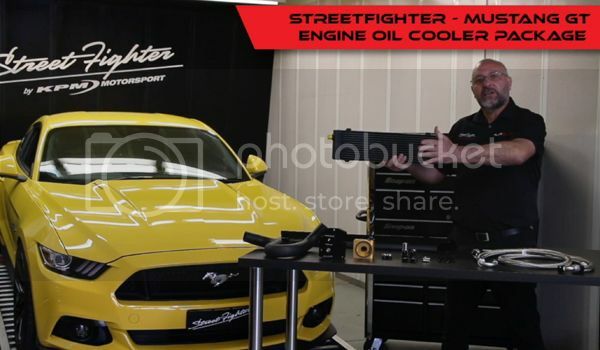 Streetfighter finished development and are in production of our engine oil cooler upgrade package for the Australian Mustang V8. 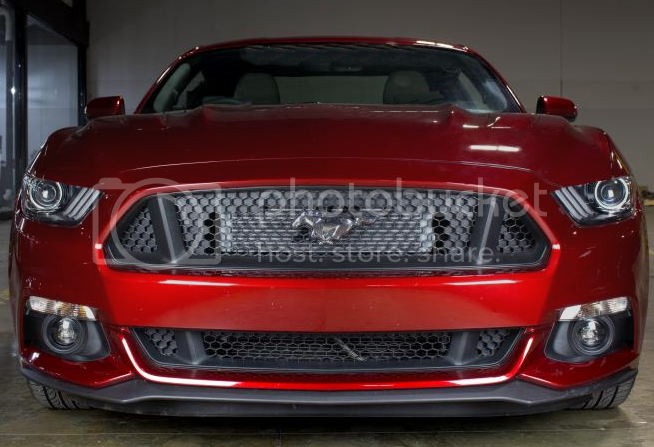 The Australian delivered Mustangs have been known to experience external and internal, oil and/or coolant leakage of the standard OEM engine oil cooler. We expect both the Streetfighter Engine Oil Cooler Package and Streetfighter Oil Pressure Monitoring Kits to be ready for release before end of 2017. Pricing soon to be released. Last edited by KPM Motorsport; 12-11-2017 at 01:06 PM. Due to immediate need and demand we are running a short production run before Christmas. You will need to contact me directly as we have not yet activated sale on our online store. As a an intro and added bonus until xmas , Streetfighter will include a free Ryco SynTec High Performance Oil filter worth $36 to forum members only*. Mishimoto who are one the world leaders in cooling technology supplying both race bred and street performance vehicles worldwide. and the specifically engineered mounting plate that is designed to divert maximum amounts of cool ambient air through the cooler. This amounts to maximum cooling of your engine oil before being diverted back to your engine. 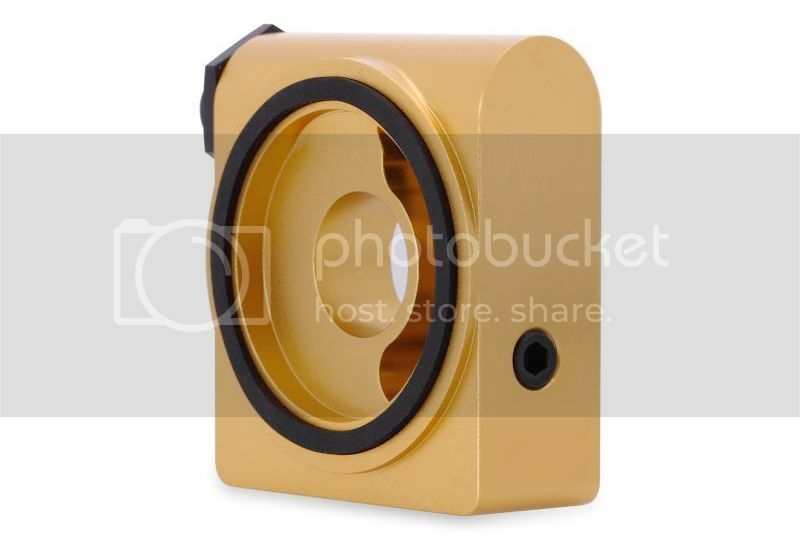 The cooler and mounts are made of sturdy lightweight material ensuring lifetime engine protection. This a lightweight, high-flow sandwich plate built from 6061 Aluminum.The built-in thermostat prevents oil flow to the cooler until the engine oil reaches activating temperature, allowing for both a faster warmup at startup and extra oil system protection in cold climates.The included 85 degree Celsius thermostat can be changed with a 71 or 93 degree unit, adding unparalleled control over your desired engine oil operating temperature. 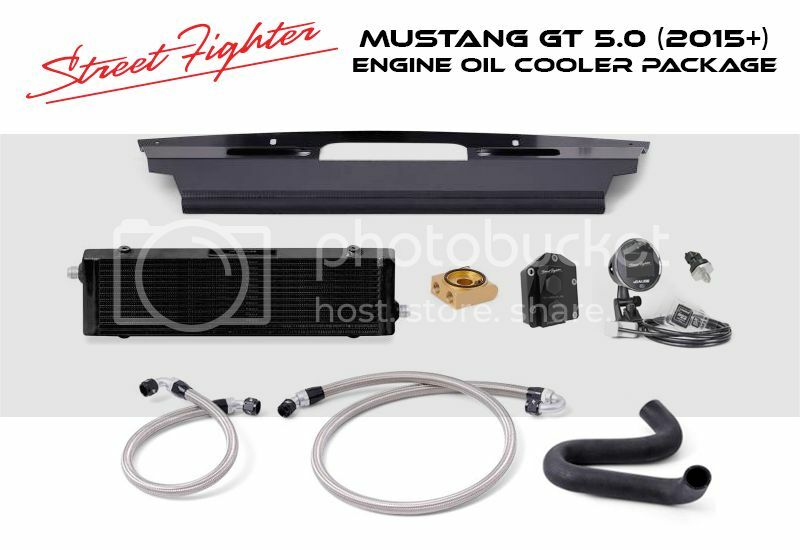 The sandwich plate is mounted under your RHD Mustang oil filter boss and accommodates the correct fittings to supply oil to the front mounted cooler. This manifold is a direct replacement for the troublesome RHD factory oil cooler. It completely deletes the standard cooler and acts as a bypass for the oil to be directed to the sandwich plate and front mounted cooler. The by pass manifold is made of high grade anodized aluminium and accommodates fittings for optional oil pressure and oil temperature sensors. 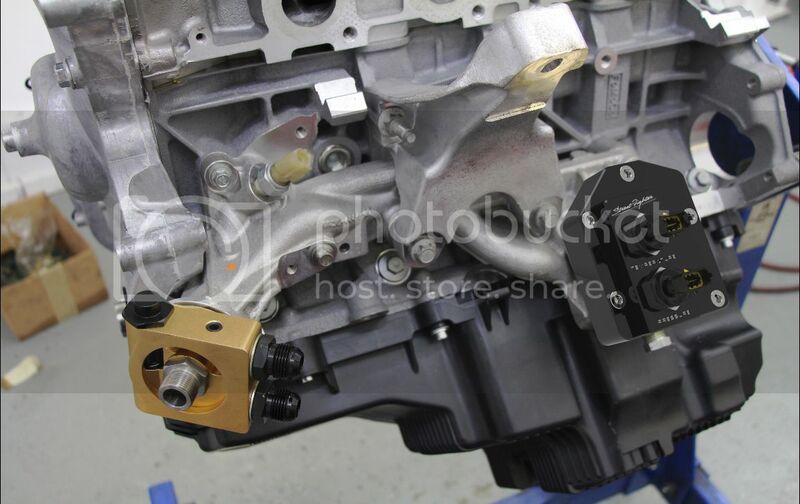 This manifold is crucial in ensuring the RHD Mustang engine oil cooling system operates correctly and eliminates any risk of oil cooler failures . 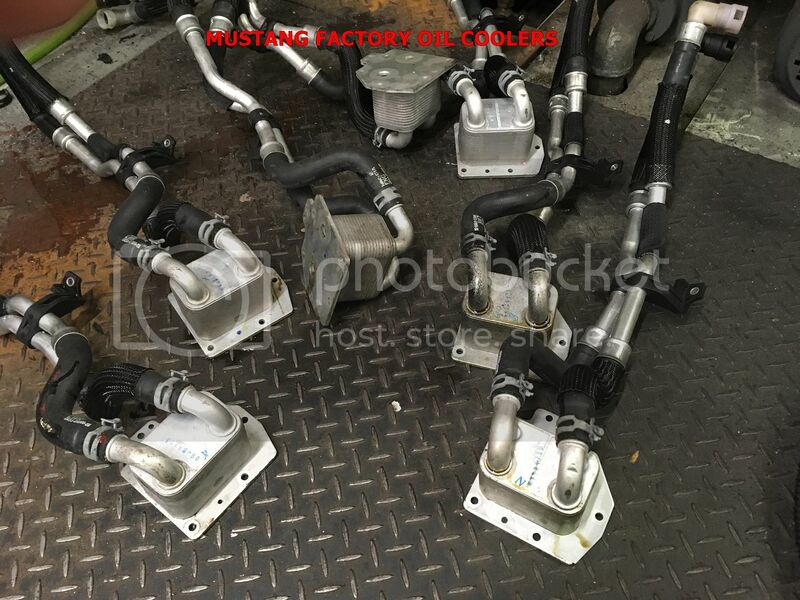 Several other kits on the market are either generic or made for the LHD Mustang and require messy and expensive removal and modification of the standard oil manifold , LH engine mount and oil filter relocation. The Streetfighter Oil by pass Manifold is a simple direct replacement fitting made exclusively for the Australian RHD Mustang , retaining the reliability and neatness of all factory components in their original position. Last edited by KPM Motorsport; 08-02-2018 at 12:29 PM. 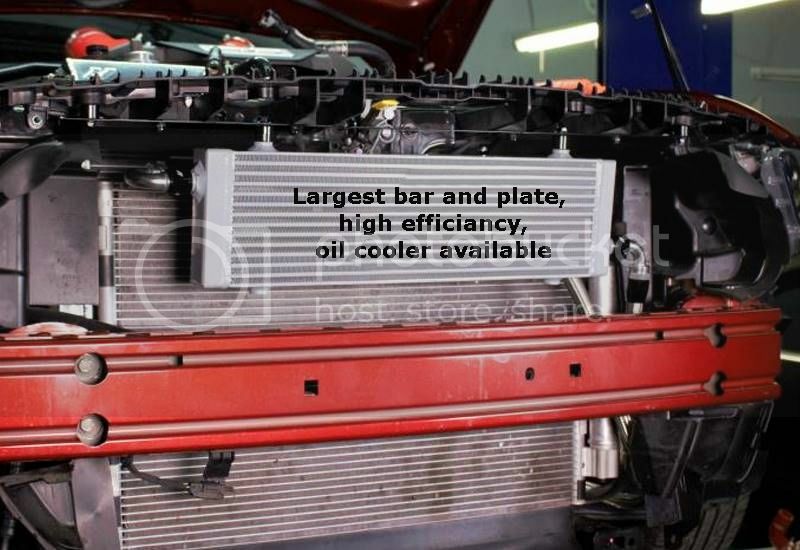 After extensive testing in regards to why standard oil coolers are failing, our findings are proving the positioning of the standard cooler is the primary cause. Being mounted under the hot exhaust manifold is not ideal for any type of cooler , however we believe the primary reason for failures is the unusual frequency of oil pressure pulsation at this mounting point. We have electronically logged oil pressure wave forms at several differing points on the 5.0 engine and have found the mounting area of the standard oil cooler to be the worst for pressure pulsation. This pulsation increases substantially and erratically with engine revolutions and load. 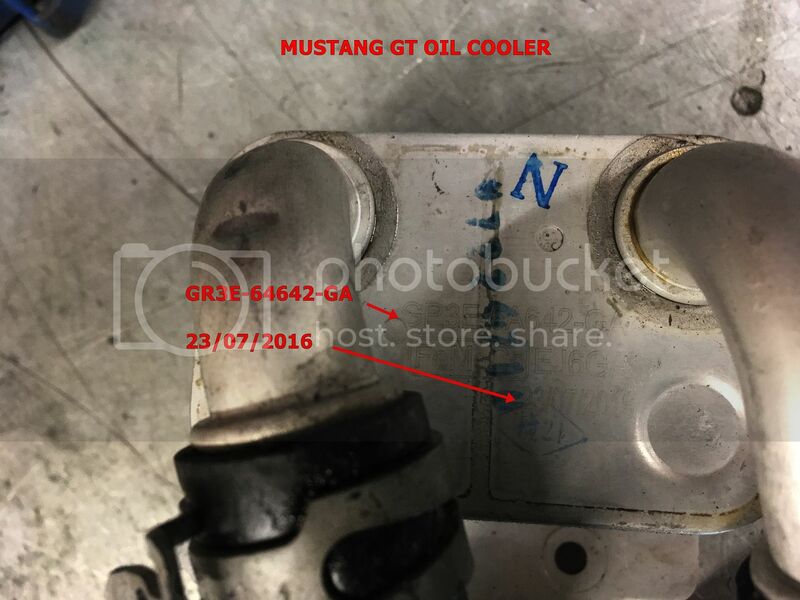 We have also logged the oil cooler mounting position for the LHD Mustangs and found no such pulsation , possibly explaining why the U.S Mustangs do not have a problem with failure. A possible combination of heat and poor component quality may also increase chances of the cooler failing when placed in a position where there are erratic pressure frequencies. Please note that these are our own internal findings and may not be the same findings of the OE manufacturer. 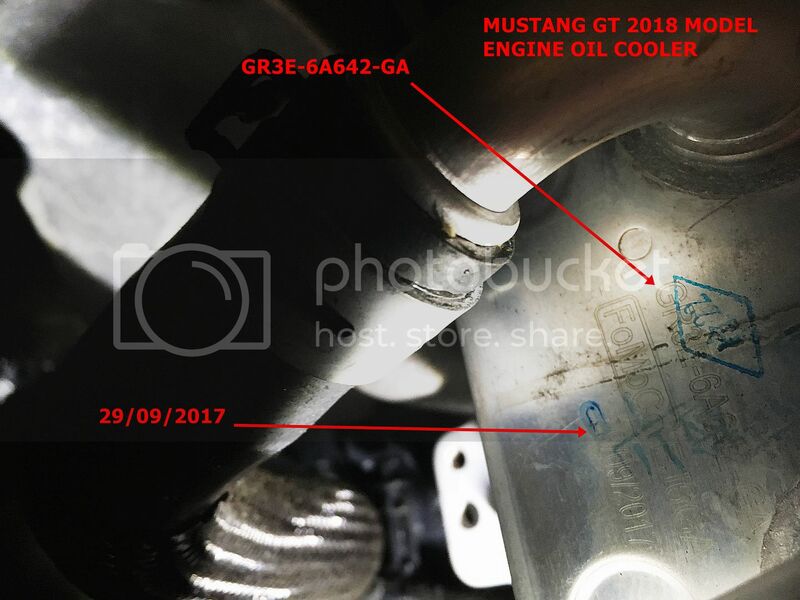 We have been waiting for the 2018 Mustang to inspect it to see if the oil cooler had been upgraded. As per the pictures below it seems that the part numbers remain the same as the previous 2015-2017 models. The first picture is many of the standard coolers that we have replaced over the last year. It seems that by part number and prefix of the oil cooler has not been changed. Ford may have retained the same part number and prefix , while manufacturing a more robust unit. We tried to see if there are any physical, material and manufacturing differences between the early coolers we and the new 2018 Mustang coolers. Externally all looks exactly the same. We cannot be sure if Ford has manufactured a more robust unit, along with the unit looking the same , the physical positioning is all exactly as previous models. We are now waiting to carry out our first 2018 cooler replacement to test if the erratic oil pulsation problem from previous models still exist. To be clear we have stopped selling the sensor monitoring system pending our findings. We have since discovered that it is definitely not the sensor that is faulty, rather the positioning of the sensor. (as explained in the previous posts above). We are almost ready to release the replacement set up. We will be contacting you shortly once resolved. 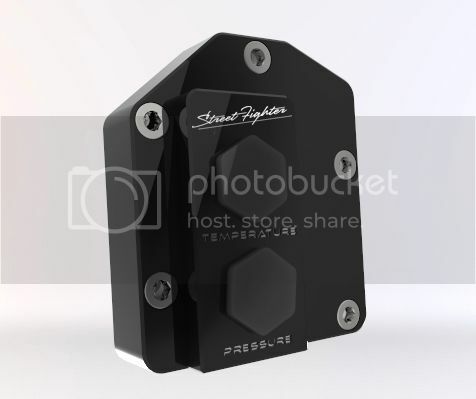 We have seen several new aftermarket oil cooler designs that place there cooler significantly below the level of the engine sump and oil drain plug. I would agree that the flaw with this style of oil cooler can retain up to 1 litre of old oil that cannot drain and would remain in the engine oil system. We have also incorporated a secondary oil sump plug at the base of the Streetfighter Oil cooler by pass manifold to absolutely ensure ALL old oil can be drained completely. This is critical for medium and long term engine protection. No other kit on the market has these vital features.